Thomas Piketty is Professor at the Paris School of Economics. Arthur Goldhammer received the French–American Translation Prize in 1990 for his translation of A Critical Dictionary of the French Revolution. Figure 1.3. Global inequality 1700–2012: divergence then convergence? Figure 11.11. Which fraction of a cohort receives in inheritance the equivalent of a lifetime labor income? than the rate of growth of income and output, g.
wealth distribution is occurring on a global scale. 2014-06-14 15:12:47 T is book is based on sources of two main types, which together make it pos-sible to study the historical dynamics of wealth distribution: sources dealing with the in e qual ity and distribution of income, and sources dealing with the distribution of wealth and the relation of wealth to income. 2014-06-16 13:28:03 Over a long period of time, the main force in favor of greater equality has been the dif u-sion of knowledge and skills. 2014-08-11 00:42:45 modern redistribution does not consist in transferring income from the rich to the poor, at least not in so explicit a way. It consists rather in f nancing public ser vices and replacement incomes that are more or less equal for everyone, especially in the areas of health, education, and pensions. 2014-08-13 18:12:16 T e overall conclusion of this study is that a market economy based on pri-vate property, if lef to itself, contains powerful forces of convergence, asso-ciated in par tic u lar with the dif usion of knowledge and skills; but it also contains powerful forces of divergence, which are potentially threatening to demo cratic societies and to the values of social justice on which they are based. 2014-08-13 18:12:33 T e principal destabilizing force has to do with the fact that the private rate of return on capital, r, can be signif cantly higher for long periods of time than the rate of growth of income and output, g.
2014-08-13 18:13:06 dominant over those who own nothing but their labor. Once constituted, capital reproduces itself faster than output increases. T e past devours the future. 2014-08-13 19:43:49 . It is possible, for instance, to spend a great deal of time proving the existence of a pure and true causal relation while forgetting that the question itself is of limited interest. in 1910, the eve before two world wars, the inequality of capital ownership in Europe reached its highest level in history since industrial revolution. US' total income inequality in 2010 is similar with Europe's in 1910.
the extreme concentration of wealth in Europe around 1900 was in fact characteristic of the entire nineteenth century. All available sources agree that these orders of magnitude--90 percent of wealth for the top decile and ad least 50 percent for the top centile--were also characteristics of tranditional rural societies, whether in Ancian Regime France or eighteenth-century England. to sum up: the reduction of inequality in France during the the twentieth century is largely explained by the fall of the rentierand the collapse of very high incomes from capital. No gengeralised structural process of inequality compression (and particularly wage inequality compression) seems to have operated over the longrun, contrary to the optimistic predictions of Kuznets's theory. Currrently, income from capital exceeds income from labor only in the top 0.1 percent of the income istribution. In 1932, the social group was 5 times larger; in the Belle Epoque it was 10 minutes later. make no mistake: this is a significant change. The top centile occupies a very prominent place in any society. It structures the economic and olitical landscape. This is much less true of the top thousandth. Although this is a matter of degree, it is nevertheless important: there are moments when the quantitative becomes qualitative. The change also explains why the share of income going to the upper centile today is barely higher than the upper centile's share of total wages: income form capital assumes decisive inportance only in the top thousands=th or top ten-thousandth. Its influence in the top centile as a whole is relatively insignificant. 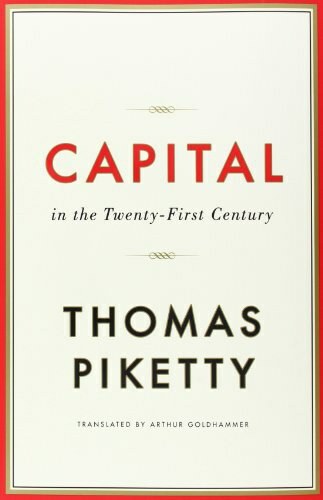 from here, it's easy to see Marx' influence on Piketty. Piketty uses the theory of influcence of economic change on societal structure from Marx other than the partisan and majority vote mode in political economy. Thus the labor market was totally transformed over the past century, but the structure of wage inequality across the market barely changed over the long run, with " the 9 percent" just below the top and the 50 percent at the bottom still drawing the same shares of income labor over a very considerable period of time. Goldin and Katz have no doubt that increased wage inequality in the United States is due to a failure to invest sufficiently in higher education. All signs are that the Scandinavian countries, where wage inequality is more moderate than elswhere, owe this result in large part to the fact that their educational system is relatively egalitarian and inclusive. The payment of a monthly other than a daily wage was a revolutionary innovation that gradually took hold in all the developed countries during the twentieth century. This innovation was inscribed in law and became a feature of the wage negotiations between workers and employers. The daily wage, whichi had been the norm in the nineteenth century, gradually disappeared. This was a crutial step in the conmstitution of the working class: workers now enjoyed a legal status and received a stable, predictable remunerations for their work. This clearly distinguished them from day laborers and piece workers--the typical employees of the eighteenth and nineteenth century. Specific investment: the particular functionws and tasks that a firm needs to be performed often require workers to make specific investments in the firm, in the sense that thses investments are of no (or limited) value to other firms: for instance, workers might need to learn specific methods, organizational methods, or skills linked to the firm's production process. If wages can be set unilaterally and changed at any moment by the firm, so that the workers do not know in advance how much they will be paid, then it is highly likely that they will not invest as much in the firms as they should. Black hole: if noe tries to measure income growth by using household survey data, it is often quite difficult to identify the reported rates of macroeconomic growth: Indian and Chinese incomes are certainly increasing rapidly, but not as rapidly as one would infer from official growth statistics. This paradox-sometimes referrd to as the "black hole" of growth-is obviously problematic. the rocketing executive pays and the takeoff of Supermanagers in Anglo-Saxon countries, especially in United States. On one hand, the specific institutions such as corporate hierarchies and compensation committees play a role in this phenomenon. on the other hand, technological change, especially information technology may also enhance the inequity of marginal productivity (Li). Recall that in the 1950s and 1960s the United States was more egalitarian than France, especially in regard to the wage hierarchy, But ih has been this way since 1980, and all signs are that this change in senior management compensation has played a key role in the evolution of wage inequalities around the world. if we look at various performance indicators, such as sales growth, profits, and so on, we can break down the observed variance as a sum of other variances: variance due to causes external to the firm (such as the general state of the economy, raw material price stocks, variations in the exchange rate, average performance of other firms in the same sector, etc.) plus other "nonexternal" variances. only the latter can be signigicantly affected by the decisions of the firm's managers. if executive pay were determined by marginal productivity, one would expect its variance to have little to do with external variances and to depend solely or primarily on nonexternal variances. In fact, we observe justr the oppisite: it is when sales nad profits increases for external reasons that executive pay rises most rapidly. This is particularly clear in the case of US corporations: Bertrand and Mullainhatan refer to this phenomenon as "pay for luck". more explainatory dynamics behind "pay for luck", rather deduce it as paradoxical. After World War I, the tax rates on top incomes, profits, and wealth quickly rose to high levels. Since the 1980s, however, as the ideological climate changed dramatically under the influence of financial globalization and heightened competition between states for capital, these same tax rates have falling and in some cases have almost entirely disapperaed. the economic model generally used to explain this relative stability of the return on capital at around 4-5 percent (as well as the fact that it never falls below 2-3 percent) is based on the notion of "time preference" in fovor of the present. In other words, economic actors are characterised by a rate of time preference (usually denoted &) that measures how impatient they are and how they take the future into account. For example, if &=5 percent, the actor in question is prepared to sacrifice 105 euros of consumption tomorrow in order to consume an additional 100 euros today. This "theory", like many theoretical models ineconomics, is somewhat tautological (one can always explain any observed behavior by ammusing that the actors involved have preference- or "utility functions" in the jargon of the profession- that lead them to act that way), and its predictive power is radical and implacable. In the case in point, assuming a zero-growth economy, it is not surprising to discover that the rate of return on capital must equal the time preference &. According to this theory, the reason why the return on capital has been historically stable at 4-5 percent is ultimately psychological: since this rate of return reflects the average person's impatience and attitude toward the future, it cannot vary much this level. during the French Revolution, the egalitarian, antiauthoritarian, liberal legislation (which challenged parental authority while affirming that of the new family head, insome cases to the detriment of his spouse) was greeted with considerable optimism, at least by men-- despite being quite radical for the time. In theory, women enjoyed the same rights as men when it came dividing estates, according to the civil code. But a wife was not free to dispose of her property as she saw fit: this type of asymmetry, in regard to openning and managing bank accounts, selling property, etc., did not totally disappear until the 1970s. In practice, therefore, the new law favored (male) heads of families: young sons acquired the same rights as elder sons, but daughters were left behind. Pareto Law or Power Law: there will be a stable inequality. it is an illusion that inflation reduces the average return on capital, because the average asset price tends to rise at the same pace as comsumer prices. One can even imagine that inflation tends to improve the relative position of the wealthiest individuals compared to the least wealthy, in that it enhances the importances financial managers and intermediaries, also when size effect is in place. Indeed, this is the central tension of any rights-based apprtoach: how far do equal rights extend? Do they simply ganrantee the right to enter into free contract--the quality of the market, which at the time of the french revolution actually seemed quite revolutionary? And if one includes equal rights to an education, to health care, and to a pension, as the twentieth-century social state proposed, should one also include rights to culture, housing, and travel. in the modern fiscal state, total tax payments are often close to proportational to individual income, especially in countries where the total is large. This is not surprising: it is impossible to tax half of national income to finance an ambitious program of social entitlements without asking everyone to make a substantial contribution. the logic of universal rights that governed the development of the modern fiscal and social state fits rather well, moreover, with the idea of a proportional or slightly progressive tax. In conclusion, one remarkable thing about this book is that it brings forward the ineuqality of income and wealth through a simple and clear dynamic: r>g; another thing is the unpacking of inequality by using the income or wealth of decibles or centiles other than Gini coefficient, which give a too simple measurement of inequality to interpret. Th e second conclusion, which is the heart of the book, is that the dynamics of wealth distribution reveal powerful mechanisms pushing alternately toward convergence and divergence. Furthermore, there is no natural, spontaneous pro cess to prevent destabilizing, inegalitarian forces from prevailing permanently. p27 coming de cades makes this trend all the more worrisome. only one of several possible future directions for the distribution of wealth. and policies would require a considerable degree of international coordination. A simple formula backed by a few hundred years of evidence to prove that capital gain is always better than labour income. Actually you don't need to finish the whole book to realize this point. a violent and powerful but impossible to implement law to tax significantly on the rich across the global. The meaning for me is to be a capitalist. A simple formula backed by a few hundred years of evidence to prove that capital gain is always better than labour income. Actually you don't need to finish the whole book to realize this point. a violent and powerful but impossible to implement law to tax significantly on the rich across the global. The meaning for me is to be a capitalist. What do you think of the economist Thomas Piketty's forecast for greater inequality over the next 50 years as returns to capital compound and the gains are owned by fewer and fewer individuals? Doesn't your monopoly theory of innovation imply this inequality will get worse and worse? 1 He describes a world of greater inequality. I think this is happening and is an important phenomenon. 2 He explains the phenomenon as driven by high returns on capital. I think this explanation is incorrect (the real returns have been negative since 2008, with interest rates at 0% and inflation at 2% in the US). 3 He proposes much higher marginal tax rates and a wealth tax. I think this is very bad policy and almost impossible to implement, and will result in massive distortions as people try to shelter more income and wealth. I think we need to find ways to grow the overall economy faster -- without faster growth, inequality will be the least of our problems.